It's about 32 more hours till we land up in Kolkata for Durga Puja festivals and to compound things further I have not even completed fifty percent of the packing. More so I have to pack only the essential stuff as the Airlines have limited their check baggage to a measly 15 kgs. So racing against time. 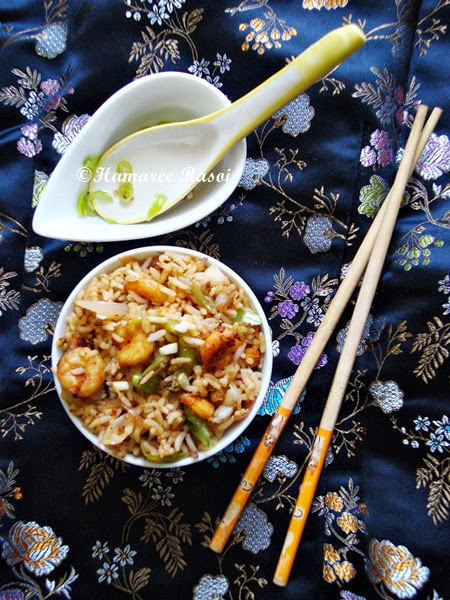 Also,I have been trying to cook most of my frozen food items before I travel and one of the last items that I prepared was Prawn Fried Rice. Was simple enough to prepare and looked well done. Pics are for all of you to judge. Marinate the prawns by sprinkling some salt and chilly powder and lemon juice in a bowl. Keep aside for 15 minutes. Heat oil in a wok or kadhai and fry these prawns on high flame for few seconds only (if you over fry prawns they will taste rubber later !). Keep aside. Wash and soak the rice in enough water for 30 minutes. Now put the stove on high flame and leave too cook. Add little salt and 2 tsp oil, when the water starts boiling lower the flame and keep an eye. This stage is very crucial as you need to check the grains if they are done. Don't over cook as the end result be mushy rice. Drain and remove the lid and let the steam pass off. Fluff the rice with a fork and let the rice cool completely. In a wok or Kadai heat oil and add sesame seeds, garlic, onions and fry it on high flame. Add cabbage, beans, fry for 3-4 minutes and mix well. Add rice into the wok and season with salt and pepper powder. Add all the sauces, fried prawns and toss everything on high flame for few seconds. Ensuring that the rice grains are intact while mixing. Serve hot ! You know I just love fried rice. Nicely done! I dont eat rice for my dinner, but if you send me that bowl of fried rice am ready to eat rite now without any hesitation.. 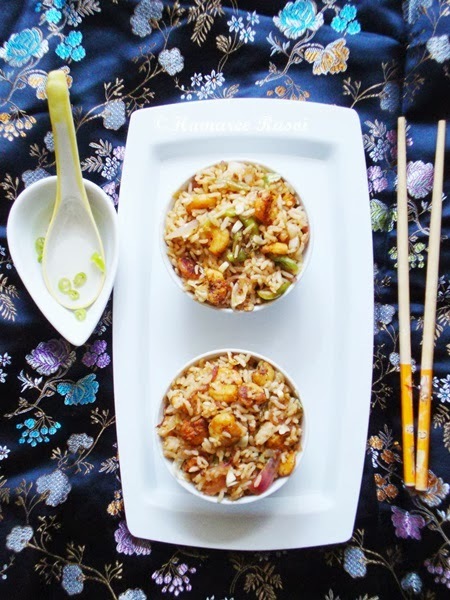 Delicious bowl of fried rice, this would be welcome anytime in my house! 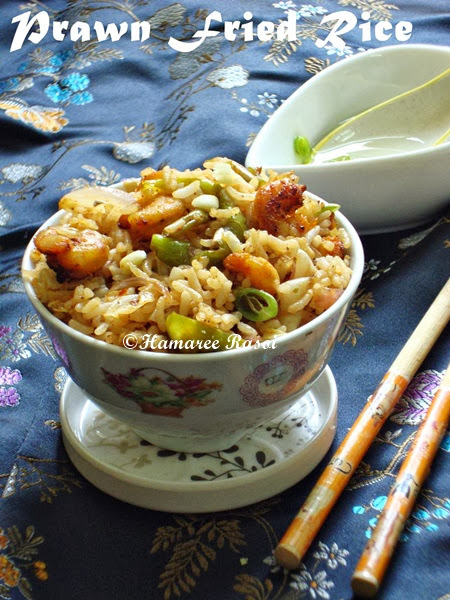 one of my favourite rice recipe Deepa. can finish both the bowls. Looks so delish and is easy to fix. Will try it with a fish or chicken. 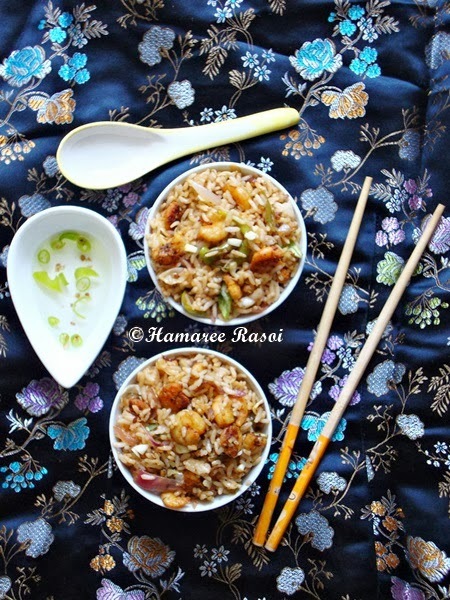 These prawn fried rice is calling my name!! Hi.. deepa... how you doing.. I am neetu from hobbychef.in and would like to invite you to write guest post for me if you are interested please visit the link below.